Fire cider (also sometimes called Master Tonic) is a traditional folk remedy infused with powerful anti-microbial, decongestant, and circulatory herbs and spices. Adding a tablespoon of this to your diet every day can help boost your immune system, stimulate digestion, and warm you up on cold days. How perfect to make for a mid-winter pick-me-up! Because this is a folk remedy, the ingredients can change from season to season depending on what’s growing around you at the time you make it. The base ingredients are apple cider vinegar, garlic, onion, ginger, horseradish, and hot peppers, which are mighty by themselves, but there are plenty of other herbs that can be added for extra strength, depending on what’s available to you. Once you’ve made the fire cider recipe, this powerful brew needs to steep in a dark cupboard for a month to extract all the goodness from the ingredients. Some people even bury their jar of this master tonic in the ground for a month while it extracts—which I wouldn’t advise if you live where the ground freezes. Once fully brewed and strained, fire cider can be taken straight by the spoonful, added to vegetable juice, splashed in rice dishes, or drizzled on salad with olive oil. You can also sautée some of the strained pulp with shredded carrots, cabbage, broccoli, and fresh herbs to make delicious stir-fries and spring rolls. For daily immune support, gargle and swallow one tablespoon of fire cider every day after breakfast. If you are fighting a cold or infection, take 1 Tablespoon of the tonic 5-6 times a day. Do not dilute the tonic in water as it will reduce the effect. Be careful: The tonic is very strong and hot, especially if you did not add honey! Do not use on an empty stomach, and start with a teaspoon for the first few times. The tonic can cause nausea on an empty stomach if you are not used to it. Fire cider is safe for pregnant women and children (use small doses!) because the ingredients are all-natural and contain no toxins. This fire cider recipe is a traditional folk remedy master tonic infused with powerful anti-microbial, decongestant, and circulatory herbs and spices. Using a peeler and a food processor, peel and grate all the roots. Combine all the ingredients in a ceramic or glass bowl, except for the vinegar and honey, and mix well. Transfer the mixture to a one-quart Mason jar. Hold your face away from the jar as you fill it. Pour in apple cider vinegar until you fill it to the top. Use a piece of parchment paper under the jar lid to keep the vinegar from touching the metal, or better yet, use a BPA-free plastic lid made for Mason jars. Store in a dark, cool place for one month and shake daily. After one month, use cheesecloth or a nut milk bag to strain out the pulp, pouring the vinegar into a clean jar. Be sure to squeeze as much of the liquid as you can from the pulp. You can use the tonic straight or, if you prefer, add 1/4 cup of honey and stir until incorporated to make cider. Taste your cider and add another 1/4 cup of honey until you reach the desired sweetness. Use the rest of the dry mixture as seasoning when cooking. Note: Turmeric stains everything, the peppers are hot, and horseradish root is strong enough to clear not just your sinuses, but the whole room. You may want to wear a mask to protect from horseradish fumes, and gloves to keep your hands clean and cool. I just made mine, so I have a month to wait. Should it be stored in the fridge during this month? Or just my pantry is ok? I keep my house cool. And then after I strain it in a month, should it be kept in the fridge then? And Thamk you for sharing the recipie! As long as it is kept cool, it should be ok in your pantry, but if in doubt, brew it in the fridge. After straining I always keep it in the fridge. I made master tonic about 3 months ago and forgot to strain it and refrigerate it— is it still okay to use it and take it? If it was kept in a cool place, it might be ok, but always err on the side of caution. My daughter gave me some a few days ago b/c I have the flu. I thought I’d make some of mine own and noticed that it is touted as an immune booster. My nutritionist told me to stay away from immune boosters b/c I have an auto immune disease. However, everything in it is natural and seems healthy. Do you have any knowledge or thoughts for people with auto immune disorders taking this tonic? I legally cannot say one way or another, and you should defer to your doctor. It’s basically ACV, and I keep reading that you shouldn’t take ACV straight, as it can damage your esophagus (and teeth?). But all the fire cider/master tonic blog posts suggest to take it straight. Maybe fine for a cold, but I know many people take it daily for health. Fire cider is a tonic best used during cold and flu season, not a daily beverage. And because it is so spicy with the many other ingredients, you only take a tablespoon, usually. I don’t think this is going to cause any damage. I didn’t realize until after that I added the honey with everything else. Is it ruined? Should I store it in the fridge for a few week instead of the counter? I can’t say for sure if it is ruined, but keep an eye on it. If it develops mold or looks “off”, dispose of it. This blend looks like kimchi’s evil brother. 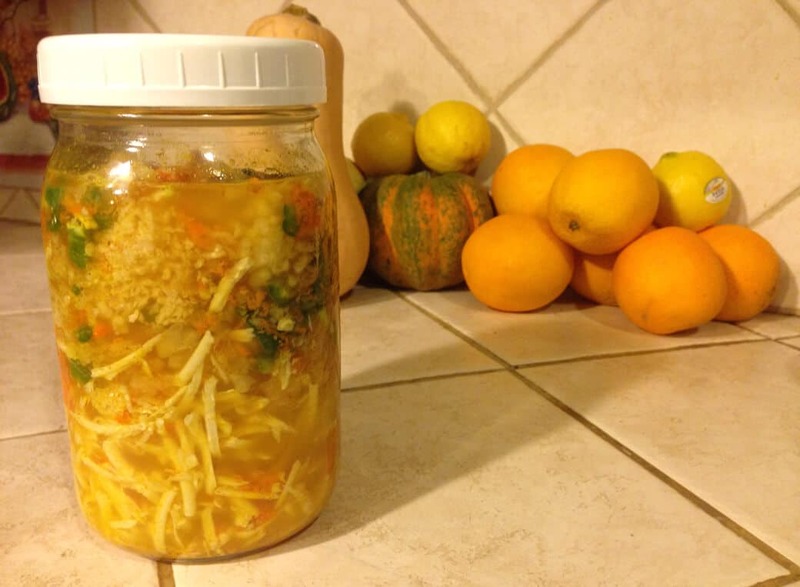 I’ve only started dabbling in home fermenting with kefir, kombucha, and some kimchi. I have no doubt this will be an immune booster, but I wish I found this a couple months ago. I will build up the courage and make some fire cider for myself. How long can you store fire cider? It can last almost indefinitely in the fridge. Just a little teaspoon of the liquid as a daily tonic is enough. And you get used to it quickly! I made a delicious lactofermented fire cider “kimchi” by mixing the strained out veges with inch chopped Napa cabbage, adding brine and whey and fermenting as for kraut. It was a big hit. Hello I love your website!!! I’m wondering, if I can’t find fresh horseradish are there any alternatives I could use instead? Can I use prepared horseradish, if fresh is not available? No. Prepared horseradish is a paste, usually with added ingredients. You need grated, fresh root for this recipe.